West Virginia has earned a stellar reputation among whitewater enthusiasts because it’s home to one of the most thrilling and challenging reaches of river, the Gauley River. The state is also home to the New River, which has options for rafters ranging from beginner to advanced. 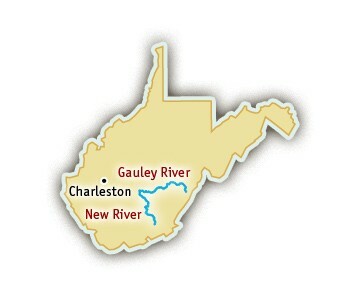 Both rivers are located only a short distance from Charleston; trips for both rivers often start near the town of Fayetteville, WV. The New River was so named because early explorers of the East Coast didn’t realize there was a river that crosses this section of the Appalachian Mountains. The river is far from new: it’s considered one of the geologically oldest rivers in the world! The New River offers fantastic opportunities for family whitewater trips, with two sections that offer varying levels of thrills. Rafters on both sections will feel as though they are traveling through time as they pass historic—sometimes abandoned—coal mining towns. The Upper New is the easiest section of the river. It’s a 15-mile stretch of river, suitable for ages 6 and up. This section offers fun and bouncy Class I–III rapids, perfect swimming holes, and easily accessible hikes. Trips on the Upper New last a full day. The Lower New is great for anyone aged nine and up. This 16-mile stretch of river travels through the New River Gorge, known as one of the most breathtaking canyons in the eastern United States. The Lower New offers Class III–IV+ rapids throughout the rafting season. The New River is free-flowing, and there’s typically plenty of water throughout the spring and summer months. While most rafters opt for a one-day trip on either the Upper or Lower, a local outfitter can help you create an overnight trip on the New River. The 25 miles of river below the Summersville Dam have been designated a National Recreation Area. Rafters here not only experience the thrilling drops and rapids, but also the spectacular scenery, including gorges of exposed bedrock, oak and beech forests, and abundant wildlife. Though some outfitters offer Gauley trips during the summer, fall is considered the prime season as this is when water is released from the dam. Two sections of river are runnable in rafts. The Upper Gauley is the real adventure: waves like roller coasters and impressive waterfalls give definite bragging rights for those brave enough to ride this Class IV-V+, 12-mile stretch of river. The Lower Gauley mixes thrilling whitewater with calmer stretches of river. The Lower is an 11-mile stretch of river, full of Class III–V rapids. Both sections are suitable for ages 15 and up. Some outfitters will combine both stretches into an overnight trip, giving rafters a chance to experience more of this fantastic river.